I read the first few pages of this a couple of years ago, on one of our Everest Get Together weekends in Pembrokeshire, and I finally got around to getting it out of the library. 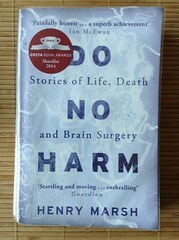 Do No Harm continued to be an engrossing (and occasionally graphically gory) read. Fascinating first hand insights into what it is to be a brain surgeon working in the NHS at the end of the 20th century and early decades of the 21st: the frustrations and irritations, the triumphs and tragedies. Henry Marsh explains neurological conditions, surgical procedures and accompanying medical terminology in day to day English, which makes these complex operations and the surgeons’ skills – technical and emotional – all the more admirable.